My simple joys and guilty pleasures while living in Bangkok. Hi everyone! I’m back 🙂 I’m sorry for being MIA (again!) for a little over a week as I have been caught up with a lot of deadlines at work as well as other issues on the side. As I haven’t been able to fix some of the pictures for my blog entries yet, I’m doing another nail polish swatch again. I was planning to try playing with my new dotting tool but I still haven’t gotten the hang of using it, meaning, I still can’t create perfect dots, tsk. Anyway, after wearing layers of glitter nail polish for the past week, I decided to just wear a simple (almost neutral) pink nail polish from Peripera with the shade PK019 (Peripera is a South Korean cosmetics brand). I reckon that a plain nail polish is easier on the eyes plus I really have no inspiration for a nail art these days. I love how they paid attention to the details of the brush handle and the packaging as a whole. It made the product look chic and special. 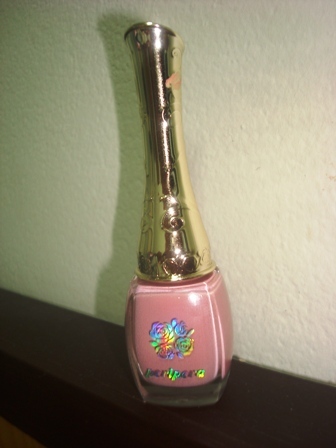 Rose Nail Polish PK019 is a limited edition 2011 F/W collection. I also got PP109, which is a purple colour and you can see the swatch here. I got both colours from Gmarket. Unfortunately, Peripera is not available here in Thailand. In Peripera’s page in Gmarket, it claimed that the Rose Nail Polish can be applied with only one layer, will dry after one minute and can last up to one week. I can really attest to all of their claims – a thick stroke of the nail polish is really enough for one layer; it dried in around 1-2 minutes and it did not chip for days. Although it comprises of a creamy and thick consistency, it was easy to apply especially with the help of its flat, wide brush. Will I recommend/ buy again? 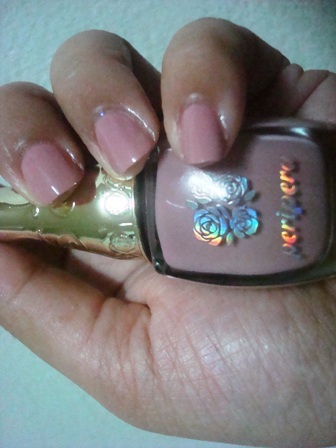 I got the Peripera Rose Nail Polish PP019 since November 2011 and it’s still in good condition consistency-wise. I do recommend this nail polish especially to those who are looking for a good quality product at a reasonable price (At Gmarket, three bottles are sold for KRW9,000 ~ approx US$8.14 + shipping, of course). I’m planning to buy more colours the next time I order from Gmarket. Have your tried any of Peripera nail polishes before? Care to share your experience? Hope you all have a fun and stress-free week ahead! and yes, it’s available at ebay (I checked last night). The color is just too cute but the bottle is simply adorable! I love how they dressed up the packaging! Good find!